This article was first published in AutoSpeed. Unlike my first attempt at a Human Powered Vehicle, which I made from aluminium, I decided with this design to use chrome-moly steel tubing. This was done for two reasons. Secondly, the strength characteristics of chrome-moly tube are already well known in the application. Again, I could simply look at my Greenspeed GTR (or any of the other Greenspeed trikes around the place – my wife is now a Greenspeed dealer), measure the outside diameter of an individual tube, and then ring up Paul Sims of Greenspeed and ask him what wall thickness the particular tube was. (Incidentally, I have always found Paul Sims to be enormously helpful – and that was also when he didn’t know me from Adam.) If the tube hadn’t broken (or overly deflected) in the Greenspeed application, I knew it would be strong enough in my application. These ideas seemed pretty fair and reasonable but then I met a problem. Even when taking this approach, the end result was heavier than I wanted – but we’ll come to that in a minute. This is a very important table – so important that I printed out a large version and stuck it on my workshop wall! (And that sentiment applies when making any type of vehicle...) Note how the thicker wall (1.2mm versus 0.9mm) really stacks on the weight – the 35mm tube with 1.2mm wall weighs the same per metre as the 44.5mm tube with 0.9mm wall. And I bet the larger tube is stronger... 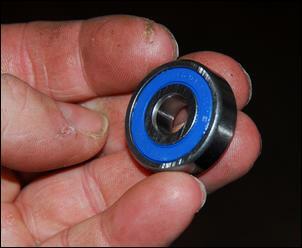 However, clearance issues in the suspension meant that the tube diameter that could be used was limited. Note that whenever there was any doubt in strength (for example, Paul Sims said he though the front leading arms could probably be 0.9mm wall), I went for stronger material. By this stage I had a pretty good idea of what the design would look like for the frame, seat and front and rear suspensions. I’d also got all the parts (wheels, gears, etc) available to be directly weighed. (This time, no forgetting about the ~1kg weight of the chain until the last minute!) So, final weights could be estimated in two ways. One was to look at my Greenspeed GTR and then work out how much heavier or lighter the differences of the new design would be. Or, alternatively, I could work out the lengths of the tube that would be used and from the above table calculate the tube weights. Then I could add these weights to the measured weights of the other components. So what could be done? And was 23 or 24kg actually too heavy? My first suspension trike, at a final measured mass of 37.5kg minus carrier, was definitely too heavy – but would 23 or 24kg be too heavy? 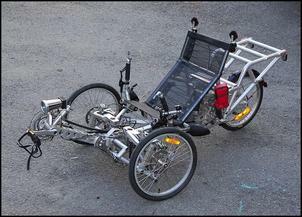 How much do other recumbent designs weigh? Answering that last question is difficult. 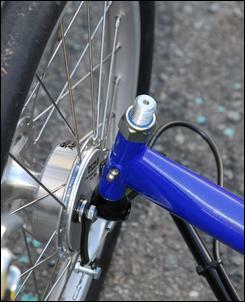 Manufacturers invariably quote weights minus drink holders, carriers and – in some cases – mudguards. And making the confusion even greater, most trike riders add accessories like lights and panniers. 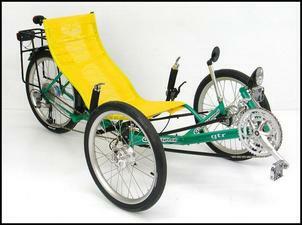 So what are the actual weights of the recumbent trikes people are riding? I posed that question on a trikes discussion group and got largely meaningless gibberish – “That depends on what the individual rider wants” and stuff like that. The nearest things I got to answers were fully equipped trikes at 20kg, 25, 27kg – including mudguards, lights and a carrier. That suggested to me that the maximum weight I should be aiming for, without a carrier, mudguard or lights, was about 21kg. Now one or two kilograms doesn’t sound much, until you realise that the weight of the airsprings, associated valving and reservoirs is 2kg. (So, if I deleted all the springs, I could make the right weight saving...) Or maybe I could leave off the seat...? Having never worked with chrome moly steel tube before, one of the things that struck me when I had the stuff in my hands was simply how strong it is. Even the pictured smallest diameter tube (19mm diameter x 0.9mm wall), when placed across blocks 400mm apart, could support in bending my full weight. 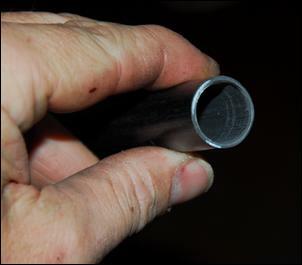 Using a hand tube bender to bend the larger 22.2mm x 1.2mm tube was very hard work indeed – this stuff is far, far stronger than mild steel tube or even aluminium tube with a much thicker wall. So could the wall thickness and/or the tube diameter be reduced without the lower strength causing problems? And, following from that, could a lighter weight chrome moly tube then be selectively strengthened? One thought that occurred to me was to fill thinner wall tubes with high density polyurethane foam. 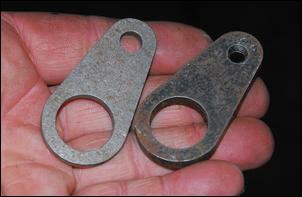 This could be done after the welding was complete, the foam being added in liquid form through suitably drilled holes. I thought that the foam would prevent buckling of the walls (or at least increase the loads at which it occurred) and so strengthen the tube. However, engineering advice suggested that the foam would be completely ineffective at this. The argument was that a tube in bending places one wall in compression and the other, opposite, wall in tension. The point of failure is where the upper wall crushes or the lower wall stretches. This occurs before buckling – as evidenced by the fact that a tube will take a ‘set’ (ie stay slightly bent) well before the walls buckle. The foam may well prevent catastrophic failure (tube buckling) but not prevent failure (tube staying bent after the load is removed). After some thought, I reluctantly decided that this viewpoint was correct. Another approach that could be taken is to use very thin wall steel tube and then to wrap it in carbon fibre tape (and a suitable resin!) to stiffen it. However, in most areas of my design (and, I think in most trike designs), the areas under the greatest stress are at tube joins – where for example, one tube butts against another. And while the wrapping of a tube is relatively simple, wrapping joins (effectively getting the tape around three tubes) is likely to be a much harder ask, both in terms of strength and appearance. Another approach is to look at where the stresses are likely to be lowest and thin-down the tube walls in just those areas. 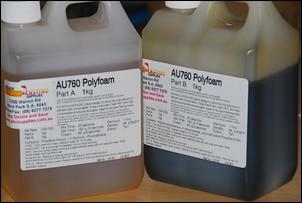 This can be achieved by selective acid dipping or even by the use of a belt sander on the outside of the tube. However, in all cases, it’s very hard to accurately reduce the wall thickness. Remember, at maximum, we’re talking here of only 1.2mm wall! Take off a bit too much and you could expect the then paper-thick metal to fail. I wracked my brains: how to make the design lighter? I then decided to look piece by piece at the predicted weights that comprised the suspension and frame - about 8kg of the total of ~23kg. The suspension, at 2kg, was not to be changed. 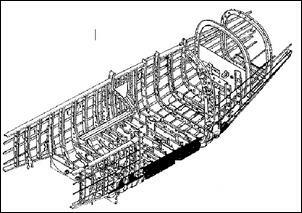 The airbags, reservoirs and associated valving were intrinsic to the design. Despite the high number, at 1.3kg the main backbone was relatively light – it provided the stiffness from which the suspension was hung, and on which the seat and pedals were to be mounted. So it had to be strong, and the 44.5 x 0.9mm chrome moly tube has a proven record of being sufficiently stiff in other trike applications. The bearings (not yet covered in this series, but they’re sealed 30 x 10mm ball bearings) and bolts were as light as I could make them while still being strong and durable. No change. The brackets on which the front and rear suspension pivots were to be mounted were – at 600 grams total – very light but still strong. No change. The sway bar? If I can actually achieve 300 grams plus some fasteners, I’ll be happy. OK, so that left as the main suspects for weight reduction the front and rear suspension arms – all 2.5kg of them. But because the suspension arms need to take all the bump, braking and acceleration forces, they have to be strong! The front suspension arms have to cope with the torsional wind-up of heavy braking, to withstand lateral forces caused by cornering, and of course support the weight. The rear trailing arms have to take in bending the full rear load of the trike, including anything on the carrier. All of which is why at this stage I’d selected heavier 1.2mm wall for both the front and rear suspension members. So what could be used instead? Perhaps drop to 0.9mm wall? But then again, I’d have a pretty silly gravestone if the front suspension broke off at 60 km/h downhill... What was really needed was strength at the joins (in the case of the front suspension, at the inner pivot point bearings and at the outer kingpin assembly) but less strength and a much lighter weight in between those two points. So what about retaining chrome moly steel tube for the ends, but replacing the tube in between? In fact, what about using off the shelf carbon fibre tube for the “in between” bits of the front and rear suspension? Given that carbon fibre is strong and light, and a tubular shape is in itself a very strong way of using material, I would have though it easy to buy carbon fibre tubes off the shelf. But, at least here in Australia, that proved not to be the case. I looked and looked, emailed lots of composites specialists and also considered cutting up common products (eg tennis racquets and other sporting goods) that use carbon fibre in tubular form. But my search was going nowhere until I stumbled on kites. I ordered two 1.5 metre long 20mm diameter x 1.25mm wall carbon fibre tubes and waited with great expectation for their arrival. One of the tubes I intended to test to destruction; the other was for use in the suspension. But I never got anywhere near as far as building the tubes into a suspension – it took less than two minutes of testing to realise that these tubes were nowhere near strong enough. As an initial test, I laid the tube across two blocks spaced about 60cm apart. I then applied some weight to the middle of the tube. However, it immediately started to deflect, and more ominously, make cracking noises! I then placed a small section flat on the ground and stood on it. The tube walls immediately crushed and I was left with a flattened, broken section of tube. In fact the tube was so weak I couldn’t even see how I could feed-in loads without the material failing at those points. I did some quick tests on 0.75 inch (19mm) ID .050 inch (1.27mm) wall carbon fiber tube. I placed two blocks 24 inches (61cm) apart and laid the tube across. I pushed down with 60 pounds, 27 kgs, in the middle of the tube. I measured the bend to be .2 inches (5mm). Very similar amount of bending to a 4130 Cro-mol tube. Then I put most of my weight on the tube, say around 140 pounds (63kg). I couldn't measure the amount of bending but there was no cracking at all. 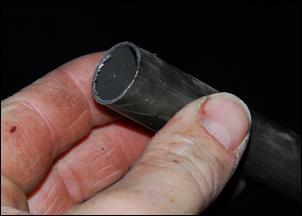 John was using a non-pultruded carbon fibre tube made by MacLean Quality Composites in the US. Clearly, these tubes are far stronger than the ones I was testing. However, they are also much more expensive and, for me, would need freight added on top of their already higher starting price. 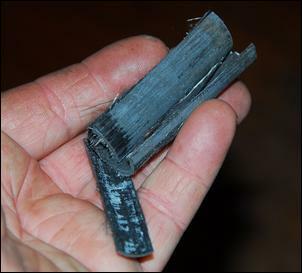 In addition to the very early failure, the other thing that disconcerted me about the carbon fibre tube was how it failed – catastrophically. Chrome moly steel tube fails by bending – it doesn’t just break off. The thought of riding down a steep hill at high speed and hitting a big bump, only to have the carbon fibre suspension arm shatter, was rather sobering. So I decided to go back to a design using just chrome moly steel tube – a much better known quantity with cheap strength and a gradual failure mode. And getting the weight down? I scrutinised literally every single centimetre of my frame design, optimising and slimming. The seat, initially intended to be removable, became welded-in. It sounds a trivial change but removing the need for metal lugs (four of them, with two pictured here) and two bolts was a substantial weight saving.